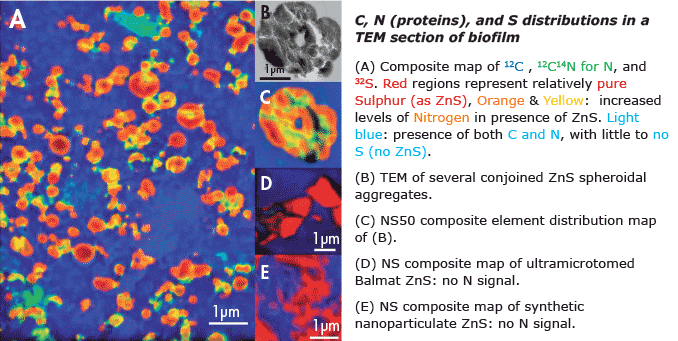 The NanoSIMS is used in this study to demonstrate the intimate association (yellow and orange areas) of proteins with spheroidal aggregates of biogenic zinc sulfite nanocrystals, an example of extracellular biomineralization. Experiments involving synthetic zinc sulfide nanoparticles and representative amino acids indicated a driving role for cysteine in rapid nanoparticle aggregation. These findings suggest that microbially derived extracellular proteins can limit the dispersal of nanoparticulate metal-bearing phases, such as the mineral products of bioremediation, that may otherwise be transported away from their source by subsurface fluid flow. The NanoSIMS offers unique capabilities of combining high lateral resolution and benchmark sensitivity for a wide range of geochemistry applications. It is the only instrument capable of imaging trace elements or isotopic enrichment down to 50nm resolution. Other technologies are limited in sensitivity (TEMS, EELS, EDS, Auger, TOF-SIMS,...) or lateral resolution (conventional SIMS, laser-ICPMS, SEM-EDS, Raman). From: John W. Moreau, P.K. Weber, M.C. Martin, B. Gilbert, I.D. Hutcheon, J.F. Banfield, SCIENCE, vol 316, 15 June 2007.